Gear Flash Downloader is a free handy tool to download SWF Flash files from web pages. 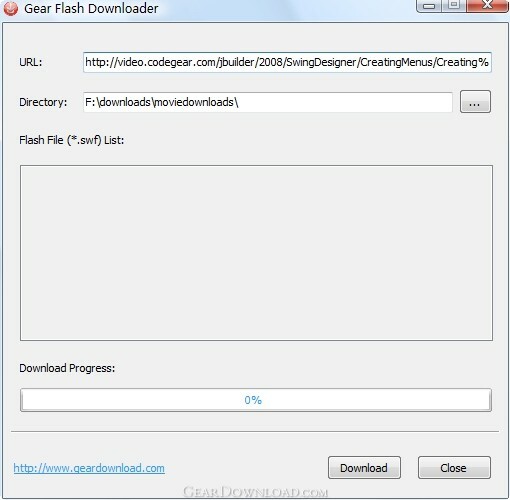 Gear Flash Downloader is very easy to use. Simply copy and paste the URL of a web page into the program, press Download button, and the SWF Flash files on the web page will be downloaded to your local computer. All your favorite flash animation, flash games and flash cards can be saved with just a single click and made available as a collection offline. What's New: Gear Flash Downloader 1.1 is optimized for downloading online flash games. Gear Flash Downloader 1.1 supports downloading flash games from game providers such as Mochi, Playtomic, Flash Game Distribution & Kongregate etc. This download (gearfd.exe) was tested thoroughly and was found 100% clean. Click "Report Spyware" link on the top if you found this software contains any form of malware, including but not limited to: spyware, viruses, trojans and backdoors. Internet Collection 3.0 - A powerful offline browser and fast file downloader in one economic package. Offline Downloader 4.2 - Download whole websites to your computer - and view them offline. Download Accelerator Plus 10.0.5.7 - Download Accelerator Plus (DAP) - The fastest and most popular Download Manager.